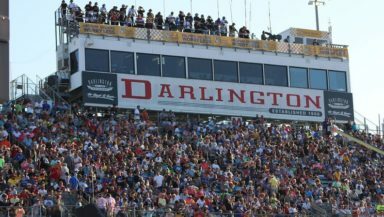 With only two regular-season races remaining in the season, drivers who have not clinched a spot in the Playoffs, have everything to gain and nothing to lose this Sunday in the Bojangles’ Southern 500 at Darlington Raceway. Sixteen drivers will compete for the championship after the season finale at Indianapolis on Sept. 9. Twelve drivers have already secured a spot, leaving only four positions up for grabs. Kyle Bush, the current points leader with six wins, will be joined by Kevin Harvick, a seven-time winner. Martin Truex Jr. is in with four wins and Clint Bowyer raced his way in by capturing two checkered flags. Kurt Busch, Austin Dillon, Joey Logano, Chase Elliott and Erik Jones have all visited victory lane once this season and will move on to contend for the championship. Three drivers have clinched their spot based on points – Ryan Blaney, Brad Keselowski and Kyle Larson. That leaves only four open positions. Currently, Denny Hamlin, Aric Almirola, Jimmie Johnson and Alex Bowman make up the rest of the championship 16-driver field. Will they be able to hold on to those spots? Let’s take a look at what each competitor must do at Darlington. Denny Hamlin only has to score eight points and he will clinch a spot in the Playoffs. If there is a repeat winner, he will automatically advance to the Playoffs, regardless of points. Hamlin has an impressive history at the track with 10 top-10 finishes in 12 career starts and the best driver rating (110.3). He’s the defending race winner and he also won in 2010. Aric Almirola can clinch if there is a repeat winner and he accumulates 25 points during the race. If there is a new winner, he could still secure a spot but would need help. Jimmie Johnson could clinch if he wins the Southern 500. He could also claim a position in the Playoffs if there is a repeat winner but he would also need help. Johnson has three previous wins at Darlington. For 14 drivers there is only one way to move up into the top 16 and that’s with a win on Sunday. This includes Bowman, Ricky Stenhouse Jr., Ryan Newman, Daniel Suarez, Paul Menard, William Byron, Jamie McMurray, Chris Buescher, AJ Allmendinger, David Ragan, Darrell Wallace Jr., Kasey Kahne, Michael McDowell and Ty Dillon. Matt DiBenedetto could clinch with a win but he would have to maintain a position in the top 30. Tune into the Bojangles’ Southern 500 Sunday at 6 p.m. on NBCSN to catch all the racing action as the countdown to the Playoffs continues.